The keto egg salad is low in carbs creamy, delicious, very filling and super easy to prepare. Enjoy a fabulous keto salad made with wholesome ingredients. Perfect for a quick keto lunch, this salad is packed with healthy fats to keep you full for longer. Eggs are the most versatile foods you can use on a low carb diet. Super-food, nature’s miracle pack of nutrients, eggs are a perfect combination of vitamins and minerals that our body needs to work correctly. 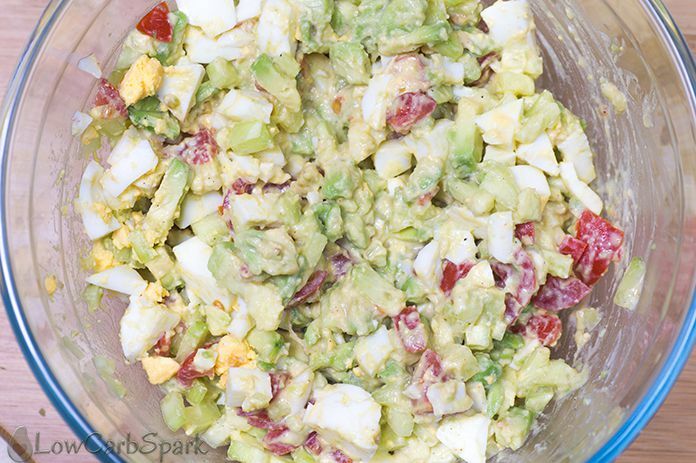 I love to make a few tweaks to the classic egg salad recipe to make it healthier and filling. 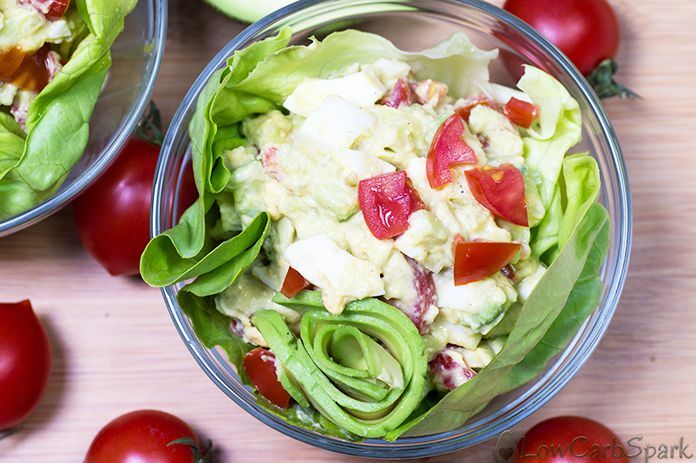 Avocado gives a creamy texture and adds tons of health benefits. You can leave the avocado out if you are not a big fan. As you can see, I didn’t use any mayonnaise because it’s hard to find one at the supermarket that’s sugar-free, has healthy fats that are keto and doesn’t have any fillers. If you want you can replace the sour cream with homemade mayonnaise or with avocado oil mayonnaise that is keto compliant and can be ordered on Amazon. Sometimes I love to add fresh dill or fresh parsley to my keto egg salad to enhance the taste and boost the healing properties. How to make keto egg salad? 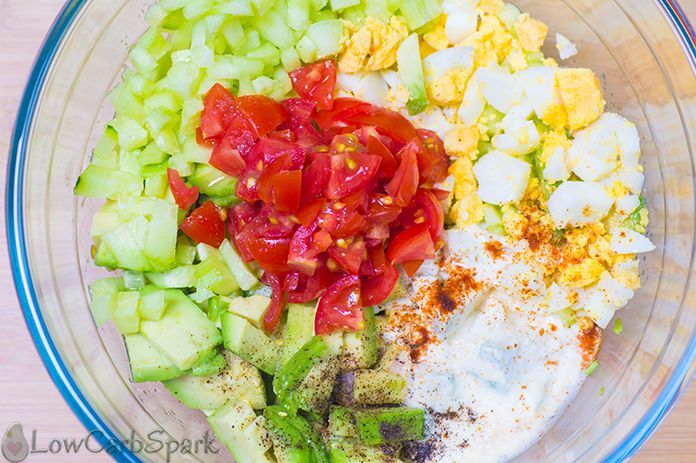 The method to make keto egg salad is relatively simple. All you have to do is to gather the ingredients, chop them into small pieces and mix everything. Boil & peel the eggs. Chop them into small pieces. In a bowl, mix all the ingredients until well incorporated. If needed add more spices, to taste. Serve in lettuce wraps or spread on a 90 seconds keto bread slice. How many carbs are in eggs? According to USDA, one large egg (50g) provides minerals, vitamins, healthy fats and high-quality protein for only 0.7g carbs. Most of this nutrients are found in the yolk, so eat the whole egg. A large egg has less than one g of carbohydrates, so most people following a ketogenic diet don’t count the carbs in eggs. They contain small amounts of every nutrient we need to be healthy. All these fantastic health benefits come with eating a large egg: 77 calories with 0.7g carbs, 6 grams protein and 5 grams of healthy fats. 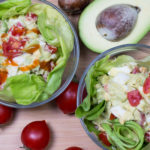 If you are bored of eating eggs the same way over and over, the keto egg salad is an excellent idea of how you can use eggs deliciously. Get those health benefits that eggs have, now. 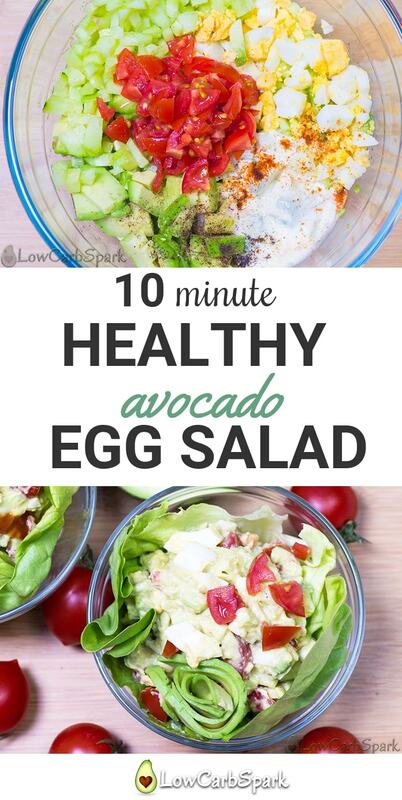 Learn how you can make a healthy keto egg salad with avocado. It’s super nutritious, low in carbs, rich in minerals, vitamins, and fiber. Perfect for a quick keto lunch, this salad recipe provides a lot of health benefits. Avocado makes the salad nutritious and healthy. Tried this recipe?Mention @LowCarbSpark or tag #lowcarbspark! Hello! My name is Ioana, my greatest passion of all time is nutrition, and I believe that food can heal. I've struggled for years with self-confidence and body issues. I'm here to provide you mouthwatering keto and low carb recipes along with great advice to help you get the best results out of being in a state of ketosis. Leave a Question, comment or review. My name is Ioana, my greatest passion of all time is nutrition, and I believe that food can heal. I’ve struggled for years with self-confidence and body issues. I’m here to provide you mouthwatering keto and low carb recipes along with great advice to help you get the best results out of being in a state of ketosis. Subscribe to our weekly newsletter to be the first who gets the latest news, recipes, updates and special offers. Hello! My name is Ioana Borcea, and I'm here to provide you with mouthwatering recipes. This blog is all about sharing my favorite tested easy to make, delicious low-carb & keto, nutrient-dense recipes. Do not use the contents of this website as medical or nutrition advice. This website is only intended for informational and educational purpose. LowCarbSpark.com is a participant in the Amazon Services LLC Associates Program, an affiliate advertising program designed to provide a means for sites to earn advertising fees by advertising and linking to amazon.com. Copyright © 2019 LowCarbSpark. All Rights Reserved.